During a recent project looking at Washington school district data, we noticed many school districts with only one high school. We were specifically interested in the urban, single high school districts – places where the distance between rival high schools in neighboring districts is only a few miles. And now that we have a blog, and a devoted readership base (tell your friends, sign up for our newsletter!) we decided it was time to dig into the data and answer a few nagging questions. The first two we’ll answer today, the remaining in a follow-up, Part II post. How common are urban, single-high school districts in Washington? How does Washington compare to other states? What are the options for increasing school district scale efficiencies? First, let’s ground ourselves with the basic stats: Washington has ~300 school districts, with an average enrollment of 3,500 students. Across the state, 79% have just one high school. These results aren’t terribly surprising since more than 75% of Washington districts are rural. These are districts where we’d expect only one high school across a large land area. What we’re really interested however, are the urban districts with one high school. For the purposes of our analysis, we categorized urban districts as those within or adjacent to major cities and suburbs with more than 100,000 people. All other districts we classified as rural. 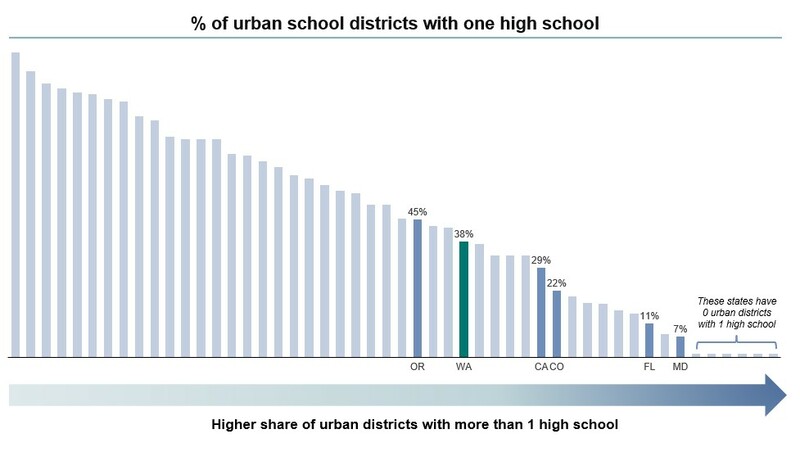 Using this methodology, we found 38% of urban districts have just one high school. Examples include University Place (near Tacoma), Tukwila (near Seattle), and East Valley (near Spokane). Aren’t district borders limited by county and city boundaries? In Washington, as in many states, district borders are not beholden to municipal boundaries. There are multiple examples of districts spanning county and city lines (e.g. Northshore and Nine Mile Falls) Boundaries are often a product of past rural consolidation efforts and previous political battles – essentially, there aren’t specific methods or rules that have resulted in the current patchwork we have today. In our follow-up post, we’ll look at how Washington’s school district map compares nationally, and discuss recent efforts to consolidate districts. Methods: To determine the number of high schools in a district we looked at all schools with students enrolled in 12th grade in the state of Washington. We then excluded alternative, charter, and virtual schools as defined by the Department of Education NCES database. We also excluded juvenile detention centers, community colleges, educational services districts, and schools with fewer than 10 high school students enrolled. To define “urban” districts, we used the NCES classification and included (all cities, and large and midsize suburbs). Last time, we discussed our learnings on why CSR is important. Today, we dive into the fun part of designing and executing an impactful CSR strategy. So we refined our research strategy and instead looked at what the fancy firms and publications to develop an “über-framework” of CSR strategy (aka the 5 most important considerations cited by the experts). Our takeaway: CSR isn’t rocket science, but like most things it requires intentionality and thoughtful planning to get it right. If you’re an organizational leader who’s intimidated by CSR, don’t be. You can get started now. Even if all the experts mentioned this lever, it’s still worth talking about. Your organization’s core capabilities should be well-connected to your CSR strategy. This will increase your impact and could lower the cost to implement. You could have the best intentions – but if your CSR strategy isn’t actually built with the people it’s meant to benefit then you’re SOL. In our research, we came across multiple articles and corporate reports citing diversity / inclusion as part of CSR strategies. We couldn’t disagree more. Diversity and inclusion is a growth strategy. Companies that can’t attract, retain, and promote a diverse workforce (defined broadly) will be at a competitive disadvantage – end of story. Thanks for reading. Let us know if you like the content so far or have suggestions for future posts and deep dives – send us an email on the contact us page. Our next post will take a more local and quantitative tack where we dig into data on Washington state school districts… stay tuned! We at Kinetic West pride ourselves on distilling complicated, long, intimidating, or even boring research and data into bite size chunks that are interesting and actionable. We plan to use this blog as an opportunity to share our learning journey, recent work, and interesting developments in the social impact sector. For an inaugural "learnings" post, we've decided to take a look at Corporate Social Responsibility (or for those in the know, "CSR"). As we've made our transition from public sector teachers to private sector consultants and now to a space in between, we wanted to dig into another topic that also resides at this intersection. But don't worry… we'll keep this short and sweet. First off, what is CSR? CSR has many alphabet soup / euphemistic monikers (CSV - creating shared value; ESG - environmental, social, and governance; social impact; corporate citizenship; sustainable business) that all seek to capture the same concept. To put simply, CSR is when organizations act beyond profit maximization to benefit the communities in which they work. Examples of CSR programs include employee volunteer days, supply chain waste reduction, non-profit partnerships, to name a few. One could think CSR sounds great for organizations with lots of time and endless resources, but you have customer orders to fulfill, employees who are depending on you, and shareholders who are expecting results yesterday. CSR is important however, precisely because each of these constituencies care about it too. Let’s also take a step back here for a 4th reason: CSR is the right thing to do for our communities. If organizations can have the rights of people, they should also have the moral responsibilities of people. Or… if you’d rather not do CSR, if you don’t have the time or resources to create and execute a CSR strategy, then don’t. But then don’t advocate for lower corporate taxes or engage in complicated tax avoidance. Pay your fair share and let our government handle societal improvements. On our next episode, we'll share our learnings on the most effective components of a CSR strategy -- synthesizing leading scholarship and pretty (expensive) graphics so you don't have to. 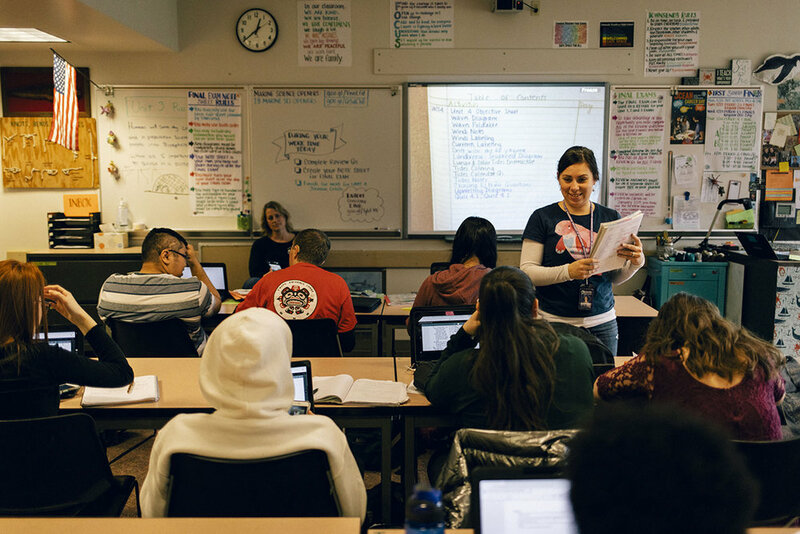 New article on the Seattle Times discussing the importance of postsecondary enrollment to reaching 70% postsecondary credential attainment in Washington. The article highlights the Edmonds School District’s postsecondary enrollment strategy, as well as Kinetic West’s recent study with the Partnership for Learning and the Washington Roundtable. New article published by Bain & Company details efforts to expand career-connected learning. The article highlights recent work on Career Connect Washington, an initiative led by former Chamber of Commerce CEO, Maud Daudon, and Marc Casale at Kinetic West.